Philip Roth’s new book (“Everyman”) begins at the end -- with the funeral of the main character -- and moves backward in time, until it circles back and reaches the character’s death again at the end of the book. That was the end. No special point had been made. Did they all say what they had to say? No, they didn’t, and of course they did. Up and down the state that day, there’d been five hundred funerals like his, routine, ordinary, and except for the thirty wayward seconds furnished by the sons -- and Howie’s resurrecting with such painstaking precision the world as it innocently existed before the invention of death, life perpetual in their fathercreated Eden, a paradise just fifteen feet wide by forty feet deep disguised as an old-style jewelry store -- no more or less interesting than any of the others. But then it’s the commonness that’s most wrenching, the registering once more of the fact of death that overwhelms everything. It is a recitation of resignation -- the funeral as a common repetitive experience (hundreds that day), a ceremony where “no special point” was made, a “routine, ordinary” event, “no more or less interesting” than all the others -- its very “commonness” its most distinctive and disheartening feature. But literally in the midst of this -- between the dashes -- is something remarkable: his brother “resurrecting” their “fathercreated Eden,” a “paradise” that was a “life perpetual,” hidden in a family’s small space. It is a literary clue that the novel may indicate that the “fact of death” does not actually “overwhelm everything” -- that the myriad of “facts” that make up a life will remain, resurrected by memory, in a story told backwards. Was she resigned and thoughtful, he wondered, courageous about everything she was leaving behind, perhaps smiling while she wept and remembered all the delights, all that had ever excited her and pleased her, her mind filled with hundreds of ordinary moments that meant little at the time but now seemed to been especially intended to flood her days with commonplace bliss? Or had she lost interest in what she was leaving behind? Did she show no fear, thinking only, At last the pain is over, the pain is finally gone, and now I have merely to sleep to depart this amazing thing? At the moment of death, the “hundreds of ordinary moments” now seemed “especially intended” to “flood” her days with “commonplace bliss.” The words take the reader back to the beginning funeral, with its “commonness” and its “ordinary” ritual, occurring hundreds of times, but with transcendent imagery hidden within the sentences (“especially intended” -- “this amazing thing” -- this “life perpetual”), in both instances brought back (resurrected) by memory. Once he was with those bones he could not leave them, couldn’t not talk to them, couldn’t but listen to them when they spoke. Between him and those bones there was a great deal going on, far more than now transpired between him and those still clad in their flesh. The flesh melts away but the bones endure. The bones were the only solace there was to one who put no stock in an afterlife and knew without a doubt that God was a fiction and this was the only life he’d have. . . . He did not feel as though he were playing at something. He did not feel as though he were trying to make something come true. This was what was true, this intensity of connection with those bones. He has a conversation with the bones. It is as if someone has caused breath to enter into them and brought them alive. The words they speak are the high point of the novel, and it would spoil it to reveal them here. They need to be read in context. Several days (and another chapter) later, in a paragraph that begins with “The words spoken by the bones made him feel buoyant and indestructible,” he dies, in a two-word sentence that makes it clear that death is only a fact. This is a novel that sneaks up on you -- by turns wistful and philosophical, sometimes funny, with Rothian rage and wit, beautifully structured, with an ending with multiple possible meanings. For those still writing the stories of their lives, making up their facts, there is a lot to think about. I am looking forward to reading it again, and thinking about it some more. An "all-powerful" Israel lobby? Would that there were more like it! Would that there had been an all-powerful Cambodian lobby in 1973, and an all-powerful Bosnian lobby in 1993, and an all-powerful Rwandan lobby in 1995! Would that there were an all-powerful Darfur lobby today! Would that other Americans would learn from American Jews that their country's strategic interests are not everything and that there are sometimes other things that matter more! America's standing by Israel over the years is one of the things that its foreign policy makers can feel proudest of, just as America's doing little or nothing to prevent the murder of legions of Cambodians, Bosnians, Rwandans, and Sudanese is one of the things to feel most ashamed of. That America has that much reason for pride is something that, in large measure, it can thank the Jewish lobby for. In this week’s Jewish Press, the Front Page Essay (“America, Israel and Tony Judt”) argues that American support for Israel reflects a fundamental American creed, one that has led to commitments of American power and prestige in even more hazardous situations -- witness JFK’s extraordinary commitment to two small islands off the coast of China in 1962 to support Taiwanese freedom. Halkin argues that the charge of anti-Semitism against Walt and Mearsheimer’s paper is “exaggerated,” a position that Richard Cohen likewise took in yesterday’s Washington Post. Cohen believes the paper was “a bit sloppy and one-sided” but criticizes respected German newspaper editor Josef Joffe for comparing it in an article in The New Republic to “The Protocols of the Elders of Zion.” Thanks to Lynn-B, you can be the judge. The London Review of Books, which published an abridged version of the Walt/Mearsheimer paper, has an extensive set of letters to the editor discussing it. Israel currently has six million Jews living in it. We will not be deterred by the threats of our enemies; nor will we listen to the advice of our friends. We will not rely on anyone else. For us, that is the most important lesson of the Holocaust. . . . 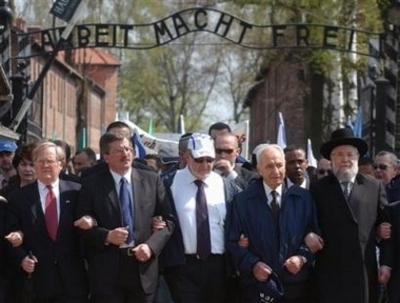 The collective memory of the Jewish people is rich in traumatic events, from the destruction of the Temple through the Spanish Inquisition to the pogroms in Eastern Europe; but no historic memory can compare to the Holocaust. . . . Therefore, distinguished Excellencies, if you want to understand Israel, forget, just for a moment, everything you know about diplomacy and the Middle East, about the Palestinians, the Security Council, international relations and the White House. Grasp, finally, the key word to understanding the Jewish people, and Israelis specifically. It's the Holocaust. Once again, the Jews stand face-to-face with a leader possessing a radical messianic worldview, who sees the annihilation of Israel as a necessary stage in defeating the West . . .
To put it bluntly, the Ayatollah Khomeini, who never talked about the Hidden Imam, was nothing short of a moderate compared to Ahmadinejad, whose resolve to obtain nuclear weapons is closely related to his messianic vision of defeating the West. . . .
Israel, it must therefore be emphasized, is far from alone in this war. For many years I have struggled with the challenge of convincing people in other countries that they, too, are in danger. As head of the IDF’s intelligence branch I went to Washington in 1996 in order to convince the Americans that the Iranians aspired to obtain nuclear weapons. Back then I found few people who were willing to listen. The good news, such as it is, is that in the last few years not only the Americans but even the Europeans have come to understand the Iranian threat. . . . It is to be hoped that the Americans and the Europeans will not fail to recognize the Iranian threat, and that they will take steps toward imposing diplomatic and economic sanctions. But Israel must prepare for the possibility that these steps will not be effective. And if we are not for ourselves, who will be for us? At Little Green Footballs, Charles Johnson has a post and a thread that are essential reading, particularly these comments: #9 (Jewnami), #23 (J. Lichty), #26 (Jewnami), #32 (St. Pancake), #35 (Model 4), #39 (Kevin the ox), #59 (realwest), #63 (alegrias), #64 (Emerald Lake Eyes), #70 (NY Nana), # 72 (buzzsawmonkey), #75 (gymnast). If you can only read one, read J. Lichty. "This Besieged One -- How Shall I Defeat Him?" The Spring issue of Azure is out. It includes an adaptation of Lieutenant-General (res.) Moshe Yaalon’s Salman C. Bernstein Memorial Lecture in Jewish Political Thought, delivered at the Shalem Center in Jerusalem on January 19, 2006. The key to Israel’s strength lies in its human resources. Human capital is the key, first of all, to the country’s strength in the humanities, culture, poetry, music, and theater; but also to its scientific and technological strength, especially evident in high-tech, medicine, physics, and aviation. In each of these areas, economic power derives not from natural resources but from human ones. The same can be said for Israel’s military strength. Israel has developed a sophisticated military force, which rests on state-of-the art weapons that are themselves put at the disposal of top-flight soldiers and commanders. . . . Both the development of weapons and the ability to put them to use can be based only on a high level of human capital. . .
[T]he different threats that Israel and the IDF have confronted during the last few years have a single common denominator: Each attempts to avoid a head-on confrontation with the IDF, and each is aimed directly at Israel’s civilian population. . . . They see Israelis as a war-weary “society of plenty,” seeking only a life of comfort and luxury, uncertain of themselves and of their inner convictions, led by people who do not believe in the nation’s willingness to fight. . . . The battles that Israel must now engage in, and will face for the foreseeable future, test not Israel’s military power but its civic resilience. The Arab nations began raising the question of Israel’s societal strength in the 1980s [with the withdrawal from Lebanon]. The discussion gathered strength after the May 1985 prisoner exchange in which three Israeli POWs were returned in exchange for the release of 1,150 terrorists. Later, our enemies were able to adduce further examples of Israeli weakness: In their telling, the Oslo accords were the result of the first Intifada (1987-1991); the Hebron withdrawal agreement was signed as a result of the 1996 “Temple Mount tunnel” riots; and Israel’s unilateral withdrawal from the Gaza Strip followed unbearable Palestinian pressure in the so-called “second Intifada” . . .
To complicate matters, the Israeli public debate, including the core of the decision-making elites, has been permeated by post-Zionist claims which are aimed at undermining the Zionist narrative. Some of these claims reflect an ideology that repudiates the belief in a Jewish state; some are a product of historical ignorance; some reflect a kind of wishful thinking; some a reflexive self-incrimination as a response to perceived helplessness; and some simply reflect the poll-driven considerations of political manipulation. Both in Israel and in universities around the world, there is a great deal of ignorance on this question. . . .
How shall I defeat him? He has weapons and wisdom on his side. Nor will I weaken his hand as in days of old. And he will forget that his cause is just. To carry out his plan.
. . . Our enemies draw encouragement from Israeli self-doubt. The greatest challenge facing the State of Israel, therefore, is to restore to Israeli society its faith in the righteousness of its path. Writing in today's Wall Street Journal, Natan Sharansky has a similar message for George W. Bush. Given his last two efforts (discussed here and here), Tony Judt was probably not the best choice to reassure us in The New York Times that the Harvard “research” paper posted by Stephen Walt and John Mearsheimer is not anti-Semitic. Having written that Israelis are “trapped” in “the story of their own uniqueness,” that their “invocation” of the Holocaust is “special pleading,” that the term “terrorist” is a “rhetorical device” (comparable to “Communist”), that Ariel Sharon “blackmailed” the U.S., that Israel may be described as a “rogue state,” to which the “fascist” label now “fits better than ever” and that the Jewish state itself is an “anachronism” that is “bad for the Jews,” and that such a state “has no place,” Judt lacks a certain critical perspective in evaluating Walt and Mearsheimer’s efforts. But since Judt's piece, like Walt and Mearsheimer’s, will circle the globe, a substantive response to his effort is required. Here is the beginning of one. Let’s re-write those sentences, eliminating some of the adjectives that are tendentious (“imperial” might and “client” state) or euphemistic (“Mediterranean” for “Middle East”), and state the issue more directly: Tony Judt cannot understand why the U.S. would align its power and reputation with a democratic state under attack in the Middle East, since the state is “small” and “controversial” with the rest of the world. In 1939 I first saw Palestine, then an unhappy land under alien rule, and to a large extent then a barren land. . . . In 1951, I traveled again to the land by the River Jordan, to see firsthand the new State of Israel. The transformation that had taken place was hard to believe. For in those twelve years, a nation had been born, a desert had been reclaimed, and the most tragic victims of World War II . . . had found a home. [O]ur own history as a nation and Israel’s have many parallels -- in the diversity of their origins, in their capacity to reach the unattainable, in the receptivity to new ideas and social experimentation. . . .
History records several  breakthroughs -- great efforts to which spiritual conviction and human endurance have combined to make realities out of prophecies. The Puritans in Massachusetts, the Mormons in Salt Lake City, the Scotch-Irish in the Western territories were all imbued with the truth of the old Jewish thought that a people can have only as much sky over its head as it has land under its feet. . . . I would like to . . . dispel a prevalent myth . . . the assertion that it is Zionism which has been the unsettling and fevered infection in the Middle East, the belief that without Israel there would somehow be a natural harmony throughout the Middle East and Arab world. Quite apart from the values and hopes which the State of Israel enshrines . . . it twists reality to suggest that it is the democratic tendency of Israel which has injected discord and dissension into the Near East. Even by the coldest calculations, the removal of Israel would not alter the basic crisis in the area. . . . The basic rivalries within the Arab world, the quarrels over boundaries, the tensions involved in lifting their economies from stagnation, the cross pressures of nationalism -- all of these factors would still be there, even if there were no Israel. . . .
Israel, on the other hand, embodying all the characteristics of a Western democracy and having long passed the threshold of economic development, shares with the West a tradition of civil liberties, of cultural freedom, of parliamentary democracy, of social mobility. . . . The choice today is not between either the Arab states or Israel. Ways must be found of supporting the legitimate aspirations of each. The United States, whose President was first to recognize the new State of Israel, need have no apologies – indeed should pride itself – for the action it took. . . . But it is yet possible that history will record this event as only the prelude to the betterment and therapy, not merely of a strip of land, but of a broad expanse of almost continental dimensions. . . . [A]s we observe the inspiring experience of Israel, we know that we must make the effort . . . The Bible is not merely the fertile soil that brought Americanism forth. It is the energy source that makes it live and thrive; that makes believing Americans willing to prescribe freedom, equality, and democracy even for a place like Afghanistan, once regarded as perhaps the remotest region on the face of the globe. . . .
From the 17th century through John F. Kennedy and Martin Luther King, Americans kept talking about their country as if it were the biblical Israel and they were the chosen people. Where did that view of America come from? It came from Puritanism . . . The “political” goal of Puritanism was to reach back to the pure Christianity of the New Testament -- and then even farther back. Puritans spoke of themselves as God’s new chosen people, living in God’s new promised land -- in short, as God’s new Israel. . . .
Freedom, equality, democracy: the Declaration held these truths to be self-evident, but “self-evident” they were certainly not. Otherwise, America would hardly have been the first nation in history to be built on this foundation. Deriving all three from the Bible, theologians of Americanism understood these doctrines not as philosophical ideas but as the word of God. Hence the fervor and passion with which Americans believe their creed. Americans, virtually alone in the world, insist that freedom, equality, and democracy are right not only for France and Spain but for Afghanistan and Iraq. Both America and Israel are exceptional nations -- the beacons of freedom, equality and democracy in the world. George W. Bush is only the latest in a long line of American presidents -- including Lincoln, Truman, Kennedy and Reagan -- who considered Americans (in Lincoln’s phrase) “an almost chosen people,” living in a country whose beginning in 1776 (in Truman’s phrase) “really had its beginning in Hebrew times,” that is (in Reagan’s phrase) a “shining city upon a hill,” and stands ready (in Kennedy’s phrase) to “bear any burden and oppose any foe” to insure the survival of liberty. Today, the forefront of that battle is in Israel, the target of an unrelenting barbaric Islamic fascism. Whether Israel succeeds or fails will set the course of the 21st century. The fact that Israel is “small” and “controversial” is besides the point. Judt undoubtedly does not understand why George W. Bush said on March 20 that "we will use military might to protect our ally Israel," nor would he have understood why John F. Kennedy committed U.S. power and prestige in 1962 to Quemoy and Matsu -- two "small" and "controversial" islands off the coast of China -- in order to protect our ally Taiwan. But that is because he is a professor of European history, not American. 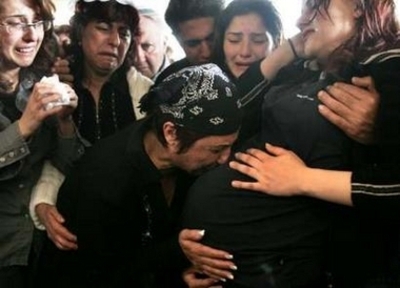 Irena Shaulov, mother of David Shaulov who was killed in the Tel Aviv suicide bombing, kisses her [nine-month] pregnant daughter-in-law during her son's funeral in Holon, near Tel Aviv, April 18, 2006. Israel's leaders on Tuesday held the Hamas-led Palestinian Authority responsible for the deadliest suicide bombing in 20 months, but stopped short of branding it an "enemy entity" or ordering a large-scale military operation. Interim Israeli Prime Minister Ehud Olmert and key Cabinet ministers decided instead to revoke the Israeli residency rights of three Hamas lawmakers who live in Jerusalem, participants in the meeting said. . . .
Olmert and senior advisers and security chiefs met for two hours Tuesday to weigh a response. . . . Participants said Olmert decided against launching a large-scale military operation and blocked a proposal to declare the Palestinian Authority an "enemy entity." Such a declaration would have paved the way for direct strikes against the Palestinian Authority. . . . 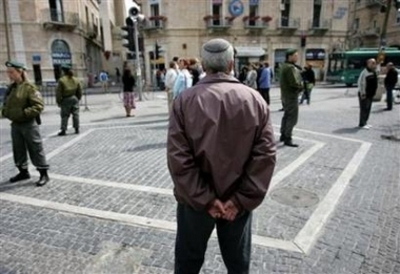 It was the second major Passover bombing in four years. An 2002 attack at a hotel in the coastal town of Netanya killed 29 people and triggered a major Israeli military offensive. Almost nothing has materialized in the way pullout supporters promised us would happen. The Gaza Strip did not calm down and the Palestinian Authority did not take matters there into its own hands in order to establish the Middle Eastern Hong Kong. Gaza is a no-man's land, the country of nobody. The Strip lacks a civilian regime, no currency, no enforcement of law and order, and most of the system tasked with providing the population with basic services is paralyzed, aside from the one run by the United Nations. Armed gangs rule the narrow, derelict refugee camp streets. The only manufacturing activity is the industry of flying iron tubes that are launched to short distances. . . . The handing over of the border crossing with Egypt to Palestinian control also failed to lead to the expected results. The border is rather porous, checks are inadequate, and smuggling is rampant. There too, the Palestinians failed to implement their sovereignty. Egyptian Border Guard troops received one kind of order: Preventing at any price the turning of Gaza into part of Egypt. They're carrying out this job, but nothing beyond. The Palestinian Authority did not use the months between Israel's withdrawal and the general elections in order to reinforce its hold among Gaza residents. It was busy with internal power struggles. . . .
For a while Gaza became Hamas land. Now, it's not even that: In fact, even the official Hamas has given up in the face of Gaza's collapse and left it to face its destiny. And Israel, even though it removed its army and settlements, and even though it closed down the crossings to the movement of goods, is still stuck with Gaza as if it was a huge bone in its throat. . . . The responsibly over it, in the eyes of the world and in some ways in our own view, has not been lifted from Israel. . . . The thousands of good jobs at the settlements have disappeared, and instead unemployment and poverty grew. The ruins of Israeli communities were not cleared, even though the Israeli government pledged (or rather, was forced to) pay for the clearing. It's unclear who the guilty party is, the PA, or Egypt, or International groups. Did Israel gain from the disengagement? Less than what its planners hoped. The United States didn't grant us even one cent in economic aid, even though in various phases of preparation for the withdrawal and upon the pullout, much was said about a special USD 2 billion grant. As of today, there's no grant. . . .
Ehud Olmert may discover that the attitude to a Sharon-made disengagement is very different than the world's approach to an Olmert-made one. The first one fascinated the world because it appeared to be a personal sea change by a hawkish leader tired of war. The second one, Olmert's pullout, would look like -- and already looks like -- as an act by a centrist politician whose party received about a quarter of the vote in the recent elections. . . . The fact that the post-disengagement reality does not resemble the earlier scenarios and predictions should make Ehud Olmert rethink his diplomatic plans. Would Israel really be able to unilaterally set its border vis-à-vis the Palestinians, a border they or the world would not accept? 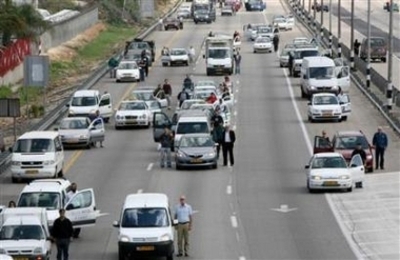 Would Israel be able to "converge" into "settlement blocs" in the West Bank and annex them? Who would finance such a move, which would cost tens of billions of shekels and not be perceived as a solution to anything? Who would prevent a tragic rift among the people? And what would be left behind in Palestine following a pretend-Israeli-withdrawal coupled with pretend-annexation? As more extensive reports in Israel have made clear, Gaza has now become a bigger security problem for Israel than it ever was during the nearly four decades that Jewish settlements were established there. This is because the need to defend the settlements gave the IDF a forward position within Gaza, and better local intelligence. They could respond more immediately to developing threats. Now they have been withdrawn from Gaza, they must watch the enemy’s preparations only electronically. It has become clear that Al Qaeda and other terror affiliates are now setting up shop in Gaza at the invitation of both Hamas and Fatah. This could not have happened, with the IDF still there. The withdrawal from Gaza was a small thing, however, in comparison to the impending withdrawal of forward Israeli settlements from the West Bank. Some 80,000 Israelis, most of whom have lived there more than a generation, will be removed behind “more defensible lines”. The acting prime minister, Ehud Olmert, is hoping to get international, or at least American, recognition for the borders behind which they are withdrawn. Good luck to him. Israel has never been repaid, except with more violence, for any of its tactical retreats, and no other fate is foreseeable. The abandonment of forward positions in the West Bank will repeat the mistake in Gaza, but on a much larger scale, while the sight of ten-thousands of Israelis being evicted from their homes, by their own army, will tear at the fabric of Israeli society. . . . The whole idea of “withdrawing behind more defensible borders” is built upon illusion. The consensus view of the appointment of Stanford Professor Arnold Eisen -- whose “Rethinking Modern Judaism: Ritual, Commandment, Community” won a National Jewish Book Award in 1999 -- as the new chancellor of the Jewish Theological Seminary seems to be that he is a “bold choice” (since he is not a rabbi), intended to re-invigorate a movement under challenge from the left by the Reform Movement and from the right by Modern Orthodoxy. Both Rabbi David Ellenson (head of the Hebrew Union College-Jewish Institute of Religion) and Michael Berenbaum of the University of Judaism used those words to describe the appointment. I think Eisen is an excellent choice, but I have a slightly different take on what it all means. Unlike the other candidates for chancellor -- who in addition to Rabbi [Gordon] Tucker have included JTS Provost Jack Wertheimer; Rabbi David Wolpe, a Los Angeles pulpit rabbi; and Rabbi Bradley Shavit Artson, who is dean of the rabbinical school at Los Angeles’ University of Judaism -- Eisen has no publicly entrenched ideological views on the issues currently occupying the Conservative movement. “Arnie is a personality who can transcend many of the intra-Conservative boundaries and transcend Conservative and non-Conservative boundaries,” said Steven M. Cohen, a fellow academic who co-authored the book with Eisen, “The Jew Within: Self, Family and Continuity in America." Transcending boundaries, getting people excited about a vision, re-energizing the synagogues, utilizing the laity, and inspiring Jewish leadership. Sounds good, but -- like a Chinese meal -- an hour later you can’t quite remember it. What is the vision we were going to get excited about? How were we going to re-energize the synagogues and use the laity? Inspire Jewish leadership to do what? What boundaries were we transcending? I’m not sure this is going to “re-invigorate” the Conservative Movement. But permit me to suggest that the death of the Conservative Movement has been greatly exaggerated, and that Arnie Eisen’s appointment actually proves my point. The challenge the Conservative Movement has experienced is a result of movements by both sides around it. Reform has moved toward tradition. Orthodoxy has moved toward modernity. Both of them have been moving toward the juncture where the Conservative Movement has been all along. The Conservative Movement was a reaction to both a perceived rigidity of religion on its right and, on its left, one with few rules at all. The new movement was based on a belief that the ideal place was a combination of ancient wisdom and modern knowledge, acknowledging both tradition and change as necessary parts of life, with issues to be struggled with by a free people bound by a heritage, not to be buried under absolutely rigid rules nor decided by reference to individual taste. A movement that has in it Gordon Tucker, Jack Wertheimer, David Wolpe and Bradley Shavit Artson is the opposite of a movement in crisis. It is one that has attracted some of the most brilliant intellects of its generation. Now it has persuaded one of the brightest and most engaging academics in the nation to move across the country to lead it. Arnie Eisen will be successful for the same reasons the above individuals have succeeded -- he brings a combination of personality and intellect, an ability to communicate an excitement about Judaism and to articulate its relevance to the questions with which we deal every day. Expect both Reform and Orthodoxy to move even closer, and all three movements to flourish. [W]e should wonder about slavery and freedom every night of our lives. We should always sit down at the table with the question of redemption in our thoughts and our hearts, for we always live in an unredeemed world. . . .
Passover rituals express the potency of faith in small acts. The grief of ages is in an herb, slavery in an unleavened bread, and redemption in an untouched cup of wine. “Let my people go” is only half the sentence. Do you know the other half? Watch this three-minute video before your seder -- worth watching in its entirety. It is not history that gives Passover its warrant. Quite the opposite: What makes tonight so full of promise and burden, like freedom itself, is that it breaks through history. It disrupts the everydayness. Why is this night different from all other nights? Not because we are set free, but because we may realize we are set free. Nor is it the celebration of freedom that fills this night with awe but what follows: the plunge into the Wilderness. That is, the search. And tonight it begins anew. If Abraham did not send Hagar and Ishmael into the desert, but we imagined it; if we had not been slaves but imagined it; if we had not been 600,000 strong at Sinai, but imagined it; if God did not let us cross into the land until a generation had died in the wilderness, but we imagined it; if David did not have Uriah killed so he could marry Bathsheba, but we imagined it; if we imagined the need for a land to create a light for the world . . . if all the contradiction and paradox were not dictated on Sinai in 40 days, but heard by us over those thousand years, and our errors written down and not denied or blamed on someone else -- then the book is all the miracle anyone should ask for . . .
Abraham Solomon Goldman who, as I used to laugh to myself, possessed the most Jewish name in America, was appropriately and devoutly religious. He prayed every morning and walked to temple every Saturday for the Sabbath. . . . Through his guidance, I learned to see the importance of tradition, the significance of retelling and remembering the Passover lore . . . . So I decided that a year after his death, at our Passover dinner we would remember the story of my grandfather. . . .
As I kneaded the matzo meal into a sticky paste to make dumplings for our soup, I remembered ancestral slaves turning mortar into the bricks that made the Pyramids. I served sweet potato gnocchi with roasted red pepper sauce -- the color of fire and strength. Grilled asparagus and radicchio represented spring, the season of freedom and renewal. Dessert was a creme caramel, my own Manna Flan -- because it tasted so sweet you could pretend it fell from heaven. I filled the food with my grandfather's faith . . . .
We all took turns reading the Passover story. We sang some Hebrew songs and we raised our glasses of wine to my grandfather and toasted, "L'Chaim," to his life. My own father, the agnostic scientist, winked and said, "Delicious." We sanctified life and legend with my supper. That night religion revealed itself as a background setting to the story of my life and a place setting at my table. My family felt connected to something bigger, back to a time even before my grandfather, back to a very old history and powerful beliefs. . . .
That seder was the finest meal I have ever prepared: It was a eulogy and a commencement all in one dish -- seasoned with nostalgia and savored like hope. Adria’s recipe for Manna Flan is here. 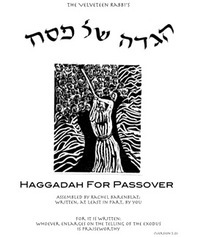 Every year, a group of college students crafted a new haggadah. We had wonderful conversations and arguments about the purpose of the seder, the purpose of feminism, how Judaism and feminism intersect. We wrote some terrific variations on familiar prayers and songs. We learned from each other, and sometimes surprised ourselves. [T]he process was priceless: it taught me how deeply fulfilling engaging with Judaism can be, and how much more "mine" the holidays feel when I study them, learn about them, and reshape my observance with my own two hands. . . .
[E]very year I develop a new Velveteen Rabbi's Haggadah for Pesach, which I use to lead seder . . . . My haggadah collects poems and prayers from a variety of sources, along with readings I wrote myself. Some of it is traditional; some of it is not. water like bowls of tears. to do and stronger light. Tonight we should wonder about slavery and freedom, realize we have been let go for a purpose, consider that we are set free to begin anew, recognize the miracle of the book we are reading, remember the stories of our grandparents, and their grandparents, and their grandparents, who got us to where we are, thank God for what has been done for us and acknowledge our consequent debt, and pass the message on to our children as a priceless heritage, for reasons described in greater length here. [T]he September 11th attacks affected me. It affected my thinking deeply. The most important job of the government is to protect the people from an attack. And so I said we were going to stay on the offense two ways: one, hunt down the enemy and bring them to justice, and take threats seriously; and two, spread freedom. . . . Some view the attack as kind of an isolated incident. I don't. I view it as a part of a strategy by a totalitarian, ideologically based group of people who've announced their intentions to spread that ideology and to attack us again. That's what they've said they're going to do. . . I guess, my answer to your question is, is that you got to be ready for the unexpected. And when you act, you base your decisions on principles. . . . I want you to understand this principle, and it's an important debate and it's worth debating here in this school, as to whether or not freedom is universal, whether or not it's a universal right of all men and women. . . . And if you believe it's universal, I believe this country has -- should act on that concept of universality. . . .
[A]s young policy-makers, you need to seriously consider whether or not this country of ours is going to be confident enough to continue to lead. . . . And this is a serious debate that needs to be taken . . . And we've got to be confident in the values -- listen, we were formed on the natural rights of men and women. Those weren't American rights. They were natural rights. There's something greater in our founding that speaks to kind of the universality of liberty. Neither party expected for the war the magnitude or the duration which it has already attained. Neither anticipated that the cause of the conflict might cease with or even before the conflict itself should cease. Each looked for an easier triumph, and a result less fundamental and astounding. . . .
Begun as a war to save the Union (not to free the slaves), the Civil War morphed into something broader, something more fundamental and astounding. Lincoln saw the hand of God amidst the horrific events of an unexpectedly long war. After the Declaration of Independence was signed, Virginia statesman John Page wrote to Thomas Jefferson: “We know the race is not to the swift nor the battle to the strong. Do you not think an angel rides in the whirlwind and directs this storm?” . . .
We are not this story's author, who fills time and eternity with his purpose. Yet his purpose is achieved in our duty, and our duty is fulfilled in service to one another. . . . In a holiday devoted to our God-given freedom, it may be worth thinking about Lincoln’s Second Inaugural and Bush’s First Inaugural, about Americans as (in Lincoln’s phrase) an “almost chosen people,” and about the current wars in the world, including Afghanistan, Iraq, Darfur and Israel. And as we recline, re-telling (in the words of the Haggadah) the story of what God did for me, to resolve to make a contribution to freedom for others -- and help direct this storm.